Apple has released some Security updates and various fixes today. Here's some handy links with a summarized list of software. The Mac OS X v10.6.7 and Security Update 2011-001 may also be obtained from the Software Update pane in System Preferences. We're interested to know what's happening out there. It has been observed through DShield data that Slammer traffic has had a sudden decline. I played with the data for a while. I could make it look like many things, such as slow and steady decline over time. However, the most compelling story is the one where the data drops on March 9 and 10. 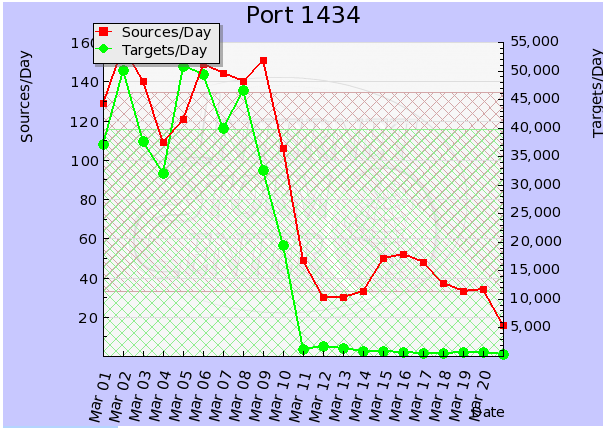 Below is the DShield data and graph on port 1434 for March 2011. It's speculative at this point as to the cause of the sudden drop. Japan's earthquake or Patch Tuesday have been kicked around. I would be remiss if I did not mention Kevin Liston's series on Slammer Cleanup during October. We are loving the thought his great effort was a catalyst for the eradication of it. So go back and take a look at your data for us and share what you're seeing. Send us your thoughts on this. # Date in GMT. YYYY-MM-DD format. # (c) SANS Inst. / DShield. some rights reserved.